Ultimately what makes a great entertainment precinct is designing spaces that allow for memorable and extraordinary experiences for the people who visit. Al Baxter, Associate Principal at Populous in Sydney has been fortunate to have experienced both sides of that equation, as an athlete and designer. Having played 69 International Tests for The Wallabies, featuring in two world cups, 121 super rugby caps over the space of 12 years and then transitioning into his second life passion, architecture; Baxter formed a deep understanding of the experience and logistics behind great entertainment-lead precincts. approached Baxter to compile a piece on the overarching design principles that make for great design outcomes around entertainment-lead precincts. The six guiding principles below draw on the work of the Populous team, with over 30 years’ of experience and 2000 sports and entertainment projects. Think about the London 2012 Olympics or the Hong Kong World Rugby Sevens Series – these experiences draw people together. Shared events are the unifying element that will keep bringing people back to watch live sport, to listen to live music or take part in community events. It is this genuine passion to create shared experiences that sets Populous apart. We understand that when someone goes to a live show, a sports game or live event it is to be part of the experience itself. This starts as soon as you leave your front door; so the fan journey needs to be understood, planned and considered as a vital part of the design. Likewise, as technology advances and community and market expectations change, venues and the precincts in which they sit need to be flexible and adaptable enough to change with them. We also understand that in order for precincts and venues to survive they need to become part of the social fabric – so consideration must be given to the physical, social and economic connections. And all this with the functionality of the venues and the precinct taken as a given. It is designing the platforms for these experiences that is our primary focus when creating entertainment precincts and highly successful venues. So with all that in mind, below are some of the critical guiding principles behind extraordinary entertainment precincts. The venue design itself needs to serve as a functional backdrop to allow extraordinary experiences to happen – great sightlines; easy access in and out; food, beverage and hospitality that delights and, spaces that feel safe and secure while still retaining the feeling of exhilaration when thousands of people come together under the same roof! People are the most important consideration. The need is to design both for the individual and the groups. Consider each and every user but also understand they are part of a group of many thousands of people. The journey can be as important as the event itself, particularly if it is poor! The journey to and from the event can establish the basis on which a fan or spectator has had a good experience or bad. There is a fundamental difference in someone’s memory of an event if one came and went via a free flowing party and the other a traffic jam! Once at or near the site, the journey includes creating a sense of anticipation. The NFL Super Bowl is perhaps the global benchmark in consistently creating extraordinary experiences – even though it is held at a different venue each year. For 33 years the Populous Event team have been responsible for the preparations and operations of the NFL Super Bowl facilities: using major overlay design and logistics planning to cope with the requirements of an international event whilst ensuring that the traditions and brand of the NFL Super Bowl are consistently delivered. The experience is considered from the moment your ticket arrives. Once inside the precinct there are a vast array of live sites, fan areas and hospitality options to cater for every fan; and the pre-game and half-time shows match the scale and vibrancy of a headline concert. Once the Super Bowl is over, the experience of leaving the precinct has been well thought-out and crafted for everyone. People are looking for ways to connect with the stars/players and design can create the money-can’t buy opportunities they crave – like tunnel clubs. The entertainment experience is now more than ever a social one, so infrastructure and spaces to allow people to mingle and share (online and in person) are critical. Design for buildings of this scale needs to cater for use by small groups one day, and the smooth operation for thousands - up to hundreds of thousands the next. Pinch points and quiet spots are anticipated; and turned into great opportunities to engage people. A great example of this is the new 61,000 seat stadium and precinct for English Premier League football team Tottenham Hotspur. Much along the lines of creating extraordinary experiences, entertainment precincts also need to create a sense of place that is unique to its context. Ideally this is done both socially and physically to create meaning and sustainability, but also acts as a way to differentiate itself in a crowded marketplace. Design must create something that is not vanilla, or could be anywhere in that country or the world. The venue must be unique to the local character and build on the heritage of the area and key existing buildings; ensuring the final outcome is authentic and offers the community something that it is missing. This project really marks the beginning of deliberately planned precincts that are built around a sports venue. In 1992, the Baltimore Orioles challenged Populous to create a new facility in a unique urban environment at Camden Yards in downtown Baltimore; designing a baseball-specific stadium, while honouring an important historic area. One of the most important cultural features of the area was the old B&O Warehouse in the outfield. This turn-of-the-century building was, along with Eutaw Street, integrated into the design, creating one of the main entry points to the ballpark during games, and functioning as a public plaza when baseball is not in session. The year that Oriole Park opened spending in downtown Baltimore increased 260 percent, with the stadium’s presence continuing to make a significant economic impact to the area today. The importance for entertainment venues and stadiums to be connected culturally and physically to the surrounding city cannot be understated. A variety of transport options such as walking, cycling and public transport are key. This also includes permeable precincts and spaces within the venue – places that are part of the journey around and into the venue itself. Whether you have a ticket to attend an event or not, people will use/visit the precinct and this must be accounted for. With this factor comes a deep understanding of how and when a venue needs to be flexible. Sense that you are connected to something bigger. Connection between a variety of specific and functional venues can also create better experiences and are particularly important for events that use multiple venues such as the Olympic Games. The aim being that the collection of venues compliments each other, the sum builds a greater sense of place than one alone AND each venue is the best it can be for its primary purpose. The London 2012 Olympic Games stands as one of the most successful of recent times, both in terms of the effect that it has had on sporting engagement, and the sheer weight of numbers involved in its planning and execution: 26 Olympic sports and 21 Paralympic sports across 29 venues in 27 days, plus all the athletes, spectators, TV viewers, media and volunteers. London 2012 showed that major global events do not necessarily require large numbers of permanent facilities, but demonstrated that temporary designs could be utilised to put on an incredible event, making use of existing city infrastructure as well as historic landmarks – creating both a great sense of occasion and a wonderful journey around the city – whether you were attending Olympic events or not. 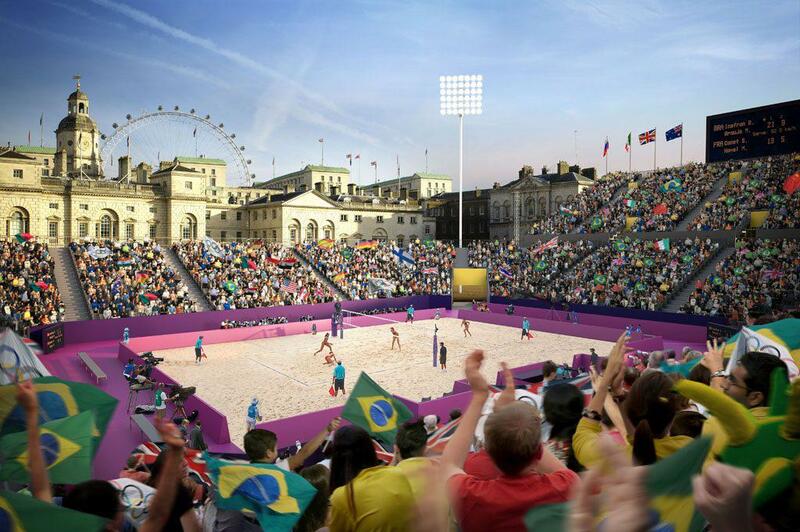 Populous oversaw the overlay design for 150 temporary venues during the London 2012 Games including th eHorse Guard Parade transformation into an open-air volleyball stadium. Although nobody is able to predict all future shifts, it is up to venue and precinct designers to be at the forefront of these new technologies and cultural trends to anticipate what might be the next big shift. One of these being seen now is the rise of virtual and augmented reality event experiences – be it as simple as the use of live sites in event precincts or as complex as large scale e-gaming in arena venues. The widespread uptake of smartphones in 2007 shifted how people experience events – from almost every fan having a mobile video recorder through to the ability to be online and connected at all times. The second being the profile of a concert goer - in the 1980’s it was predominantly male whereas now many concerts will actually have a higher proportion of females than males, meaning the requirements for toilets, food and beverage, and security are fundamentally different. Flexibility of use; creating venues that facilitate multiple potential outcomes. Including a moveable roof on venues like Etihad Stadium in Melbourne creates capacity to host events that are not on the radar at the time of construction, such as e-sports. FINA have recently amended their venue requirements to include a roof, eliminating weather conditions from impacting on international diving championships, which means that stadiums can become platforms too. Broadcasters are an incredibly important part of the mix. Especially for live sports events, broadcasters provide income and connect fans outside the venue. They want to telecast full, active venues so it’s also in their interests to support the in-venue experience, linking in with newer technologies for fan-engagement using wifi, scoreboards etc. Scale-ability and the ability to overlay will create better precincts. 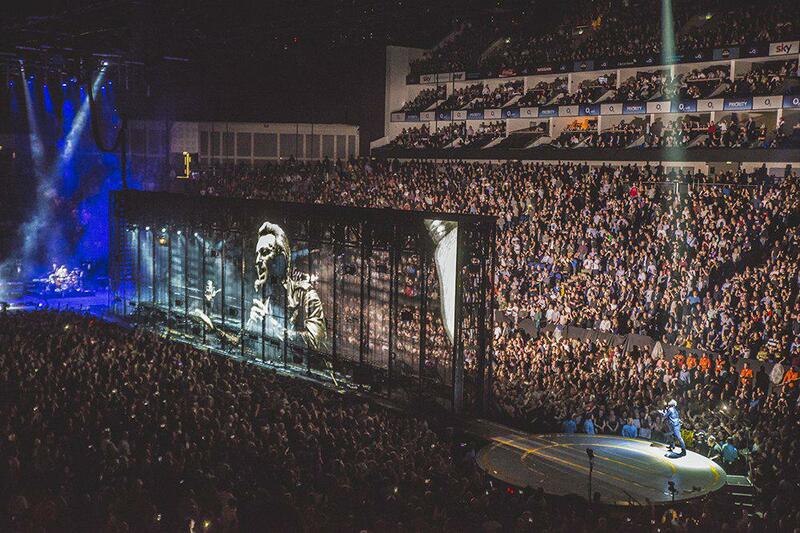 Spaces that can grow or shrink to cater for a variety of crowd sizes and event layout’s add to the long-term viability, for example the O2 Arena in London. The ability to overlay ensures the capacity surrounding the venue for temporary facilities can increase the number and type of events held in and around the building. Stadium designers need to ensure there is an anticipation for future needs; extending operator revenue beyond match or event days. Good venues are good neighbours; they are also socially self-sustaining. It’s important venues facilitate local uses such as spaces for leisure and recreation or housing. Venue and community transport needs may help to bring forward government funded infrastructure spending, supporting much wider community benefits. Innovation, balance and the ability for future development are key to sustainable outcomes. A key consideration for a self-sustaining venue is the ability to balance capital cost with future revenue generating capacity. Reducing capital expenses can be achieved through the innovative use of materials and structure as well as innovations in construction methodology and management. Revenue generation can be maximised by the designers understanding the target market, flexible venue design and allowing for phased development of the venue or immediate surrounds. 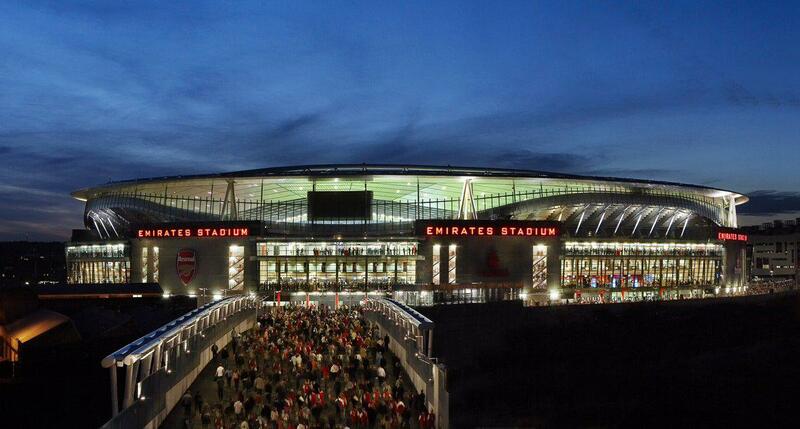 Arsenal’s match day revenue increased from £37.4m in their old Highbury stadium to over £90m in the new Emirates Stadium (equivalent to an additional income of over £1m per match), and that excludes other commercial revenue. In addition, converting Highbury to residential units delivered £157m in 2011 alone. This financial success meant Arsenal could clear all their bank loans in 2010 and have been able to emerge as a club with arguably the best financial footing of any club in Europe, applauded by UEFA as the defining model for other clubs to follow in meeting the requirements of the UEFA Financial Fair Play initiative. The widespread urban regeneration that has come about thanks to the stadium and wider master plan (including the provision of 2000 new homes, more than half of which are affordable homes) has been recognized with many awards. Great entertainment-lead precincts are part of the greater vision for a city. Through phased development and infrastructure, communities can be fostered and grow around them. They also allow for changes in market forces and demand. Not to mention maintenance and refurbishment of assets – spread out over time. Long term commitment also extends to the flexibility of use of the surrounding land providing opportunities for new hotels and accommodation, recreation facilities or parklands. ANZ Stadium (formerly Stadium Australia) is a powerful icon on the Sydney landscape. It was the largest Olympic stadium ever built and during the main ceremonies of the Sydney 2000 Olympic Games, it hosted 110,000 people. It was reconfigured to 80,000 seats with a rectangular pitch added to suit rugby league, rugby union and soccer. Moveable seats also provided a new venue for AFL and cricket from 2002 and over the past 17 years ANZ Stadium has also hosted concerts, exhibitions and public gatherings. 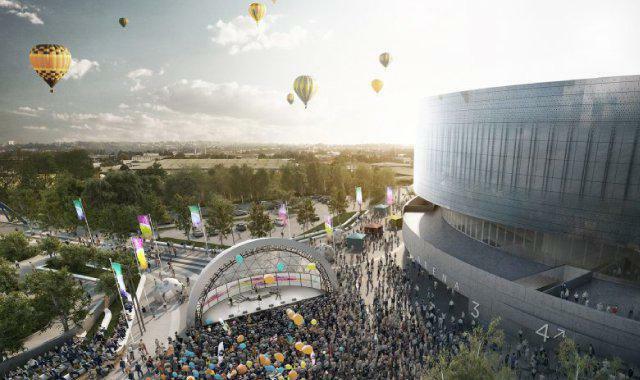 Sydney Olympic Park Authority currently have their Master Plan 2030 exhibited for public review, ensuring the stadium and surrounding parklands remain world class and relevant to the community. Al is both an architect and an ex-professional sportsman who was the most capped prop in the history of Australian Rugby Union, when he retired in 2011. His time as a professional sportsman, combined with his design expertise, make him uniquely qualified to create spaces where athletes can develop and excel. Al has extensive knowledge in sports, master planning, leisure, convention and exhibition design, having worked both in Australia and internationally.